Dracula Untold is not your typical vampire movie and by that I mean you don't get to see a lot of vampire action the whole time. What you do get to see is Vlad (Luke Evans) being pushed so far that he'll resort to just about anything to protect his family and kingdom. He finds his answer in a "master vampire" (Charles Dance) and takes the name of Dracula in order to protect his home from a Turk warlord with an immense army coming their way. Of course, there's a catch: the master vampire only gives Vlad a limited number of days with the supernatural powers at his disposal. If he gives into the thirst for human blood before those set days are up, he will becomes the Dracula vampire for eternity. Does Vlad have enough time to stop a whole army and save his own kingdom before his time is up? Or will he surrender to his thirst? Dracula Untold had a good story and great acting, but I would have liked more origin story from the master vampire and how they first came to be. As far as good fun, the movie was still great and I would watch it again when it is released on Blu Ray and DVD. Luke Evans does a great job playing Dracula and you wish you could become his version of a vampire rather than those lame ones from Twilight that glow rather than burn in the sun. If you're a fan of the Underworld franchise, or if you just like action, fantasy, horror, drama, and war films then go watch this movie. 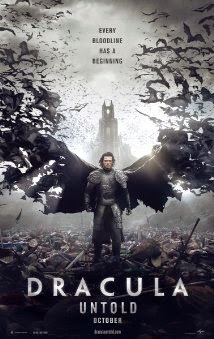 If you're not a fan of vampire movies, you'll probably be fine waiting to rent Dracula Untold.